Determining root causes seems to be a lost art. It’s a discipline, and if we aren’t willing to apply disciplined thinking when diagnosing a problem in the business office, we end up making things worse. In getting to the root cause of a problem, you should step back and look at the problem (the undesired effect) holistically, not thinking in terms of blame, but instead carefully examining the system or the process. This is known as systems thinking. There are many quality tools for determining root cause. Brainstorming is one methodology commonly used in lean—seeking the opinions of the people who do the work. Brainstorming can be great for opening up dialogue and generating a free flow of ideas. But it has downsides, too: it can take time to build the trust necessary to think outside the box, and it can cause teams to veer off on tangents that aren’t productive. This is why improvement experts have designed more methodical, focused ways to generate ideas about root causes. One way is to use a cause-and-effect diagram, which was originally the brainchild of Japanese organizational thinker Kaoru Ishikawa but has spread throughout the world because of its universal usefulness. I first saw cause-and-effect diagrams in 1992, when I was an aircraft maintenance instructor at Delta Airlines. A facilitator from aerospace manufacturer Pratt & Whitney was leading us in brainstorming the root causes of certain aircraft operational issues. The facilitator focused our input into the Six Sigma categories known as the 6 Ms, which organize root causes by type: Man, Machine, Methods, Materials, Measurement, and Mother Nature. When I saw my first cause-and-effect diagram, it was a revelation. Still, there was a key improvement I needed to make for brainstorming problems in the business office. As we brainstormed reasons for various aircraft problems, the facilitator wrote each one on the flip chart underneath its appropriate category. In a short period of time, he took our individual ideas and made them visual to compare them, connect them, and spur even more ideas. Then all our concerns were documented for future reference. I was fascinated by this process, and by the valuable diagram we created. I knew I would use it in the future for many of my management problems. The most popular bad guy by far was the “Man”—in other words, participants tended to blame people (and sometimes, people who were in the room at the time, which could be humiliating). This happens especially when teams aren’t experienced in lean improvements and don’t necessarily know what they’re looking for. As the facilitator, it puts me in an awkward spot because I know the process is always at the root of the ailment (especially lack of organizational focus), but teams get focused on the poor performance of people, and it can be difficult to backpedal out of that. Plus we’d always end up with the ubiquitous and overused solution of “So-and-so needs more training.” Eventually, I realized that keeping the “Man” as a topic of conversation was leading teams in the wrong direction and keeping everyone confused. Using the 6Ms always leads to a long list of root causes, but no action steps. How do you link these causes to lean wastes so that you can apply lean countermeasures? It makes for a difficult transition—there’s no quick solution. 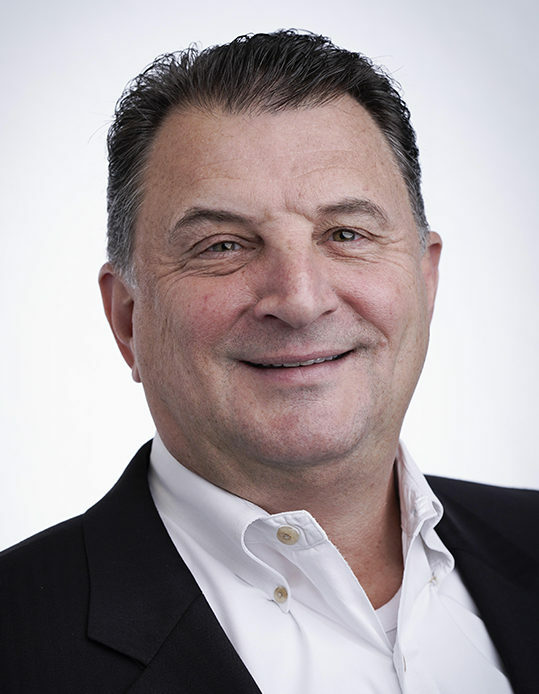 The 6Ms may work well for manufacturing (sans Man), but not necessarily for business processes. Some experts have adapted cause-and-effect diagrams using the 8 Ps of marketing: People, Process, Policies, Procedures, Product, Place, Price, and Promotion. But again, right there at the beginning, you’re blaming people as the root cause of a problem. For me, this was a non-starter. In brainstorming sessions, teams will often devolve into finger-pointing instead of working to identify problems with the process. Finally, I had an epiphany. What’s the central thesis of lean? The identification and elimination of wastes. In lean, those wastes are always the root cause of bad process outcomes. So why not organize a brainstorm around the 8 Wastes that plague the business office? As a team, you can use the 8 Wastes as a prompt and connect your results to a value stream map immediately, locating the problems within your processes visually. From there, you can use a tool called the 5 Whys to examine each waste, and then apply lean countermeasures such as 5S, visual management, standard work, etc. Rather than trying to force a lean manufacturing tool to fit a business office, you’re now connecting your brainstorming directly to the process you’ll be using to correct your problems. That’s the idea behind the diagram at the beginning of this post, which is something I created specifically for my course Lean Applied to Business Processes. 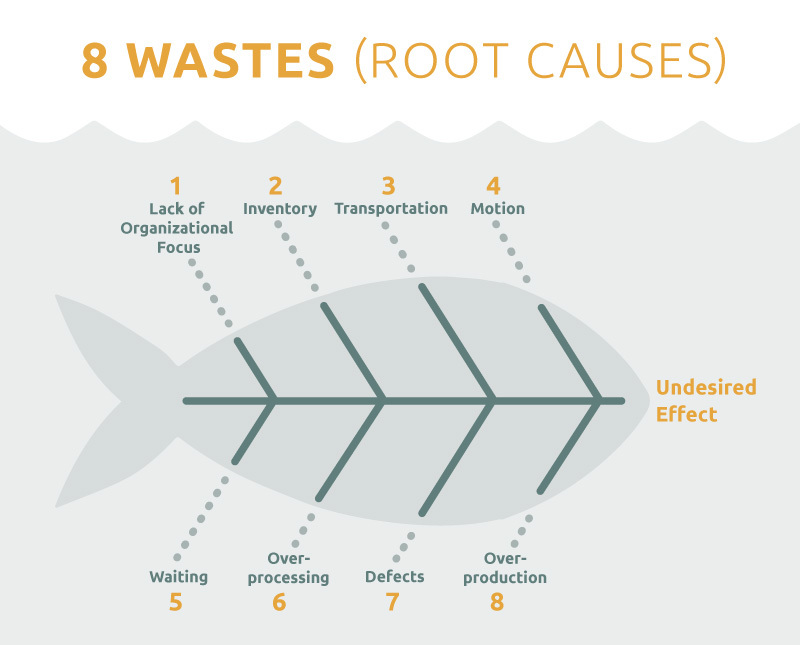 Organize your brainstorming around the 8 Wastes instead of the 6 Ms, and use cause-and-effect diagrams to categorize, record, and visualize the root causes of your problems. This will help you move much more rapidly toward creating the future state you want. Subscribe to the LeanBP Blog! I give LeanBP permission to store my name and email address for the purposes of sending me a newsletter and other relevant updates. Lean enterprise isn’t just for the shop floor—it’s also a proven tool for optimizing business processes. That’s my specialty. If you use knowledge, information, or paperwork to get your job done, and you’re looking for ways to cut waste and increase productivity, this blog is for you. My advice is aimed at executives, managers, and work teams in . . .